Originally from: Osun State, Nigeria, Currently lives in Dubai. 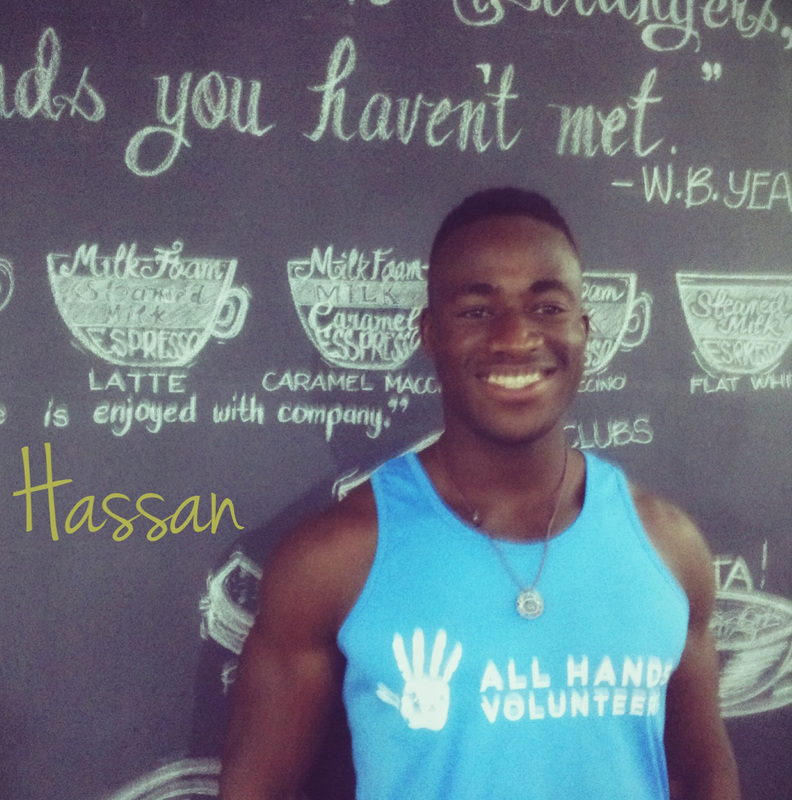 When I met Hassan, he was with his friend Costa in a coffee shop. The positive spirit that flowed from Hassan was obvious the moment he walked inside the room. His story as a volunteer is an atypical one. He visited Leyte without any intentions of becoming a volunteer at first, but after getting to know some of the other All Hands volunteers and learning about the need for helpers to build a structure somewhere in the Tagpuro area, Hassan rose up to the challenge. One really has to admire that. LL: Hassan, can you describe the place and vibe where you come from? HAB: I have been living in Dubai for some years now. Dubai is like a playground for young dreamers, because it’s a young country, the things that Dubai has achieved there within 10 years is amazing. Dubai as we know is rich in oil, however, it has diversified on to other ventures because in 10 years the oil will run out. It has become a tourist place, an important port around the region and a place of enterprise. Dubai has it’s flaws but it’s a nice city; the only way you can know it is by visiting it. LL: My impression of Dubai is that no one can go there unless you have an exorbitant amount of money or unless you enter as a worker. But as a tourist, don’t they check if you have money to be able to afford your visit? HAB: No, you need money to travel but they don’t check your level of income or something, you’ll be OK there. There are places for the working class or low income earning people too and they are just as nice as the ones for the upper class. Like cute cafés or restaurants. LL: What was you life like before you came? HAB: I am a software programmer, our clients are those that need enterprise solutions and so on. HAB: To be honest, I barely knew about Tacloban before I came. I only knew from the news about the typhoon (Haiyan), I saw the news and I just had to get here. I just hooked up with All Hands when I arrived here. I was at the Yellow Doors (hostel) and a lady there Marielle Trixie suggested that we volunteer. I started to volunteer for just half a day but it ended up to be more. I saw the site where we worked and I saw buildings that were pretty new. HAB: I saw the initiative of the other volunteers from All Hands. It’s very gratifying to see how the locals are and you can really see the gratitude by the people we do this for. HAB: Certainly, I was looking at the videos and they are educating us about the typhoon and how the death casualty was really not just 6,000. We saw a video about this shop owner whose warehouse was looted and how she just allowed the people who were in need to go ahead and get what they needed. She also allowed her warehouse to be used for charitable purposes. LL: Do you consider yourself as an activist or an advocate? HAB: I am an activist because I put action into my words. HAB: I do. I was in Magallanes St. and I saw shoes and stuff instead of corals on the sea shores but because of the things for example that All Hands that has done, there’s improvement, simple things that they have been done inspires you. HAB: The problem of generalization. LL: You mean prejudice or lack of education? HAB: No, its generalization, for example, when people think that all Muslims are bad. I am reading a book right now called "Black Swan," in the book there is a black swan, it exists but is rare, just because you only mostly see white swans, that doesn’t mean black swans don’t exist. Another example is the typhoon; before the typhoon nobody knew that a typhoon of Yolanda’s magnitude would happen but it happened and because it did, it can bring about change. This can apply to religion and so on. HAB: Extreme sports, mountain climbing, skydiving even though I cannot swim. And also BoSfit videos (extreme workout videos). HAB: I’ll go back to Dubai to my work, I still have one more subject to finish at university. HAB: Anne Frank. She was only 8 years old when the events in her diary happened and for her to think like that, I mean other kids were only perhaps thinking about hula hoops. She is one I could easily identify with. The hardships she experienced. The interview has now come to a close and it was admirable to see Hassan and Costa because they were both open and very enterprising. Indeed I may not see them again but I know I will not forget this encounter or this kindness given to us by these gents that they would volunteer their efforts for people they don't know. Hassan and Costa, thanks for all your efforts.